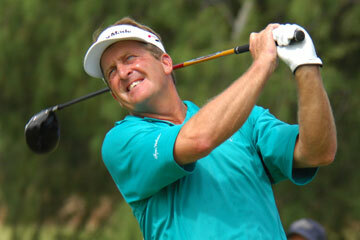 Fred Funk enters today's third round of the Turtle Bay Championship with a three-stroke lead over Kiyoshi Murota. Fred Funk isn't hitting the ball as well as he would like and still set the 36-hole record yesterday for the $1.6 million Turtle Bay Championship. He can thank his putter for that. Following his 65 on Friday with an 8-under 64 yesterday, Funk has never seen this course when the tradewinds are whipping off the Pacific Ocean. He might get a taste of that today, as rain could be on the way for the final round. Funk's 15-under 129 left him three strokes clear of Japan's Kiyoshi Murota, who shot a stellar 7-under 65 for a two-day total of 132. Tom Kite is another shot back at 11-under 133 after he fired a 66 yesterday to find himself near the top of the leaderboard for a second consecutive week. With little or no wind yesterday on the Arnold Palmer-designed course, the Champions Tour players took dead aim at the par 72 and left that number behind them as 32 golfers found rounds in the 60s compared to 13 on Friday. There were also 54 golfers, who shot 71 or better, compared to 25 during the opening round. Kite, who has had success here in the past without a win, would like to see the winds kick up in excess of 20 mph and also asked Funk to save a few of those 40-foot bombs for birdie for some of the other guys in the field, particularly him. This is Funk's first tour of duty at the Turtle Bay course. He's barely seen a hint of breeze compared to what can happen when the tradewinds come sweeping off the ocean with the northern tip of Oahu right in its sights. If that happens, considering how Funk isn't striking the ball as well as he likes, it could set up for an interesting final round for everyone. "Hey, I'm 29 under the last two weeks going into the final round and haven't even gotten a sniff," said Kite, who finished in a tie for second at last week's MasterCard Championship to Hale Irwin. "I left some stuff out there (yesterday), but I can't say I'm putting poorly. It's hard to complain with a 66, but it could have been better. Hopefully, it will be tomorrow, because it's going to need to be." What if the weather changes as predicted? "I hope," Kite said, "because this isn't the way this course plays normally. We all know what it can do here. And it's kind of what you expect. It's still going to be a shootout with one of the three of us (Funk, Kite and Murota), if not all three of us, will go fairly low tomorrow. Fred doesn't have to make all those putts. "I hear he's made some putts he thought he missed and that's always a good thing. That's how you win golf tournaments. You get the good things to happen for you. I'm hopeful there will be a little bit of wind. Anything in excess of 20 is wonderful as far as I'm concerned, because I have a little ground to make up." If Funk continues to putt as well as he has the first two days, it may be as academic as Irwin's five-stroke victory last week at Hualalai Golf Club. Funk is tied for 48th this week in driving with a 262.5-yard average. But he's tied for sixth in greens in regulation and is first in putts per green at 1.517 through 36 holes. He needed 24 putts yesterday and has only 50 through two rounds. 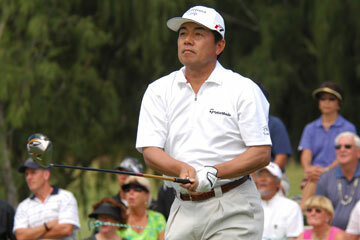 Former Pearl Open champion Kiyoshi Murota sat three strokes back of Fred Funk entering today's final round. Funk won last year's final full-field event on the Champions Tour and is only 18 holes away from winning the first full-field event of 2007, which would suit the Florida resident just fine. He concedes his ball-striking is still suspect, but he's been magical on the greens. "I putted good again," Funk said. "I kind of look at birdies like a deposit in the bank. You can never have too many deposits because you're always going to have a withdrawal. So far I haven't had any withdrawals (bogeys). I need to keep making deposits in the bank and make those guys work hard to catch me. "I know I'm going to have to do it again tomorrow. I don't know what the weather is going to be tomorrow. I heard it was supposed to rain with a little more wind. It could be a little tougher conditions. I've gotten off to two dream starts in a row on the front nine and if I can continue to do that, it would be great." The third player at the top of the leaderboard is something of a wild card. A winner at the Pearl Open a couple of times through the years, Murota played a very good round of golf with Kite yesterday, including a birdie at the last that allowed him to be alone in second after Kite parred it. If he can put together a third consecutive round in the mid-60s, it could put some pressure on Funk and Kite down the stretch, even if the conditions worsen. "I played better today than I did yesterday," Murota said. "I made some good putts." And he will probably need even more today to keep up with Funk and Kite. Like last week, Kite likes his chances, maybe even more so because of past success here, and the difficulty of the golf course. "I've always played better on tougher courses," Kite said. "They suit me. And this is a good golf course. It's going to be a fun day. I'm looking forward to it." So is Funk, who will return to the PGA Tour next week after missing the cut at the Sony Open in Hawaii. These will be the last two Champions Tour events for a while, win or lose today. "I've got to stay focused on the regular tour," Funk said. "That's where I want to stay right now for a while. I've always been told what I can't do. The first time I debuted on the Champions Tour I was a favorite. That's new to me. I've never been favored in golf in anything. "I've always been an underdog. I've always been a journeyman. A guy who maybe overachieved on the regular tour. But that's what drives me. Basically, I just want to see how long it can last. I'll be happy to transfer over when the time is right for me."